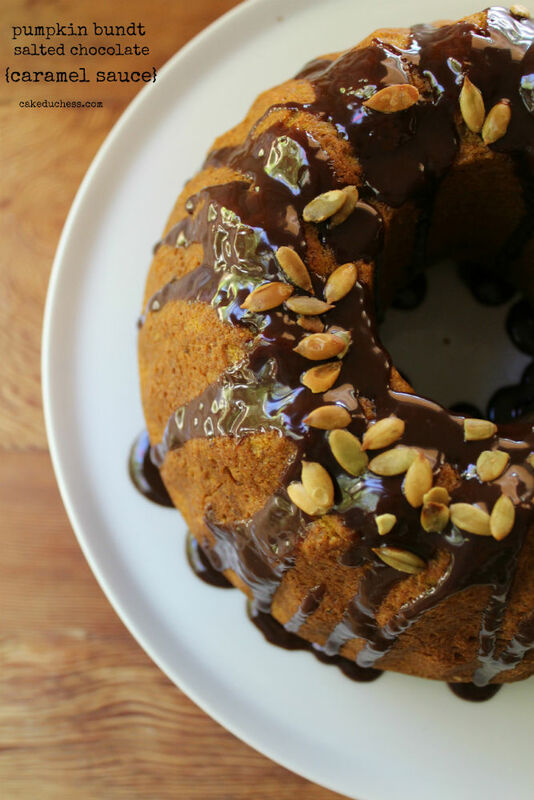 Pumpkin Bundt Cake with Salted Chocolate Caramel Sauce is simply divine! There has to be a limit to how many bundts a person could bake in a month. Or does there? I tend to prefer baking a bundt (or a ciambella-ring cake-as they’re called in Italy. 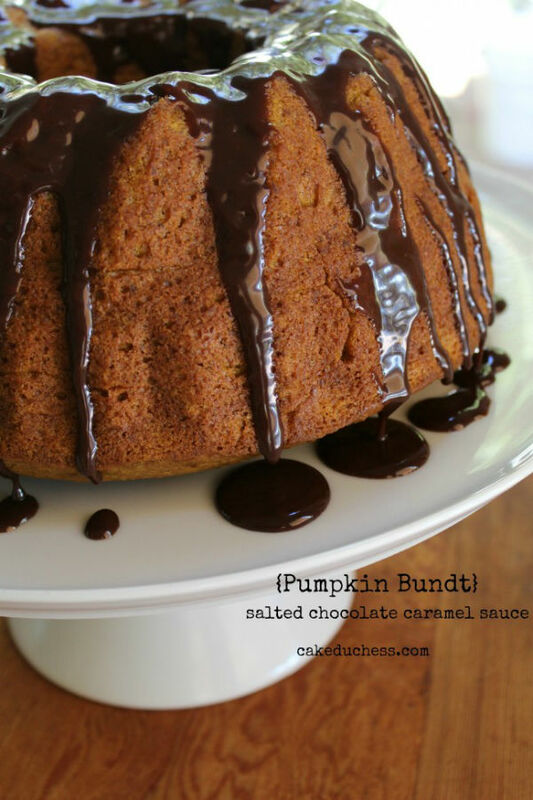 So to kick off fall, there would have to be a Pumpkin Bundt with Salted Chocolate Caramel Sauce. Right? But it’s not just a special fall bundt to commemorate the beginnings of cooler days (yes, even here in steamy Florida we have been blessed with a slight temperature change). The theme for #BundtaMonth October is Candilicious so let’s get the candy fun started! I’m not a huge candy fan. I’m not one to eat candies whenever I’m bored or for a snack. If I am going to have a candy, it will most like have caramel in it. Or for sure, if I’m craving a little bite of something sweet, it would also probably be delicious chocolate. 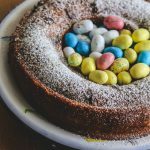 So when it came time to get some candy for this bundt cake, I checked in to see what my kids were interested in…big mistake! I heard requests for marshmallows, Swedish Fish M & M’s and a big request for Reese’s Peanut Butter Cups. Candies that they normally sample on Halloween night were all being dreamed of as starring on this beautiful bundt cake! I was swaying towards marshmallows and then realized my imagination was taking me towards a s’mores type bundt cake with marshmallow frosting. Everyone was excited but I couldn’t get my mind off of a little caramel! And then I saw the Kraft caramel pieces calling my name and grabbed a bag. That was it…well, almost! I had ideas to incorporate them in the batter and then thought of a caramel sauce. But I’ve made a caramel sauce for a few bundts and thought how to make it a little different? Dark chocolate sea salt…OK! I was in! On the day I baked this cake as soon as my son walked in the door, he immediately asked me, “Mommy! What’s that good smell? ?” My daughter declared: “It’s back to pumpkin baking time again! Yay!” I remember with my last pumpkin bundt, everyone was pretty much over the pumpkin baking season. Luckily, we are just starting it here again! The cake is moist. Oh, so moist. So easy to put together. The trickier part is the caramel sauce. I find making my own caramel sauce much easier than melting caramel candies. I don’t own a microwave and melt them the double boiler method (baine Marie). 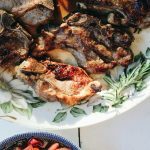 The sauce is wonderful with the addition of dark chocolate. My daughter said it didn’t really taste like caramel. Maybe next time I’ll add more caramel and less chocolate. Even though it didn’t have a strong caramel flavor, it was loved by all. In a large mixing bowl, whisk together flours, sugar, baking soda, baking powder, salt and spices. Spoon the batter into your prepared bundt pan and smooth down a little with a spatula. Bake for 1/2 an hour at 350 then lower the heat to 325 and bake for about another 20-30 minutes, or until a skewer inserted in the center comes out clean. Heat a small pan with water until it boils. Turn low so it is simmering and place a metal bowl on top of the simmer water. Place the caramels, chocolate, butter and cream to the bowl. Stir until melted and smooth. If some of the caramel pieces don’t completely melt, pour over a strainer into another bowl and let cool a little before using. Allow cake to cool for 10 minutes in the pan, then turn cake out onto a wire rack to cool completely. Drizzle on the salted chocolate caramel sauce. Amazing! You rule the world of cake baking, Lora =) What a beautiful celebration of fall and flavor! That's a super-model of a cake! I just looked and I have everything for it. I could put it in the oven right now! 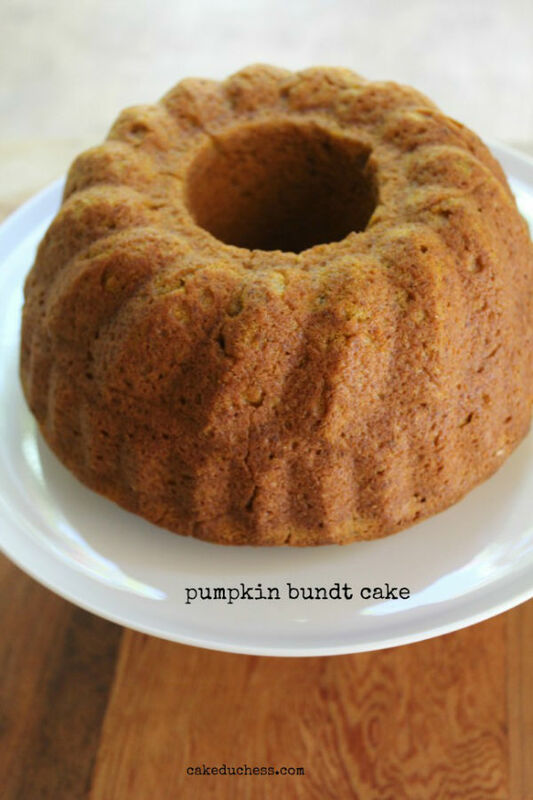 This pumpkin bundt looks like it would be delicious even without sauce. I've got to pin this! I'm sitting here trying to figure out how I've never had salted chocolate caramel sauce before and it's baffling. But I'm planning to change that real quick! Oh, and I love, love, love pumpkin. Can there ever be too much pumpkin in baking? Or chocolate? Or caramel? I submit that there cannot. This is a beautiful cake, Lora, and a great combination of flavors. Your children are so blessed! How much butter do you mix with the sugar and spices? Caramel, pumpkin, and chocolate. Yes please!!! a HUGE slice! Gorgeous bundt, Lora! I love that chocolate caramel topping too :). So many things to love. Lovely looking bundt. I've been collecting pumpkin recipes like mad, Lora, and this one is going into the pile. Your bundt looks perfect! And while it's too bad the sauce didn't taste too caramel-y, I'm sure it still tasted absolutely divine. Dark chocolate with sea salt and caramel are two of my favorite things! YUM! No – there is no limit to how many bundt cakes one can make in a month.. You are talking to a girl who owns four bundt pans. Great combo, salted caramel with chocolate and pumpkin delicious. I think bundt cake and autumn go hand & hand – bundts are so fluffy and celebratory! Your candy choice was brilliant! 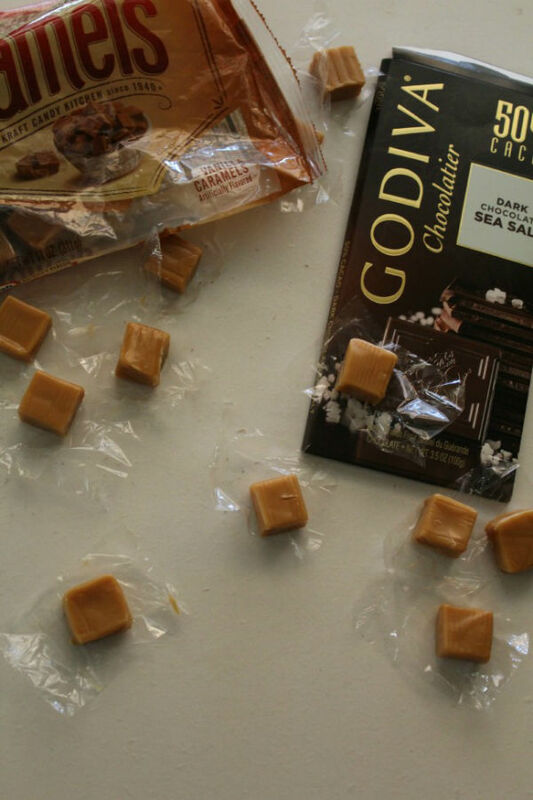 I'd take a salted chcoclate caramel sauce over marshmallows, any day. I have a Costco sized bag of Kraft caramels in the pantry and your sauce is calling my name. I can't wait to try it! Hooray for pumpkin baking season!! one of my favorite times of the year . . I've already baked pumpkin bread twice! Your kids are so cute with their suggestions .. 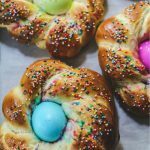 I would have loved to have seen the Swedish Fish bundt cake! 🙂 as always, your bundt is gorgeous. . love the salted chocolate caramel sauce. . omg!!! Oh my that sauce is divine! 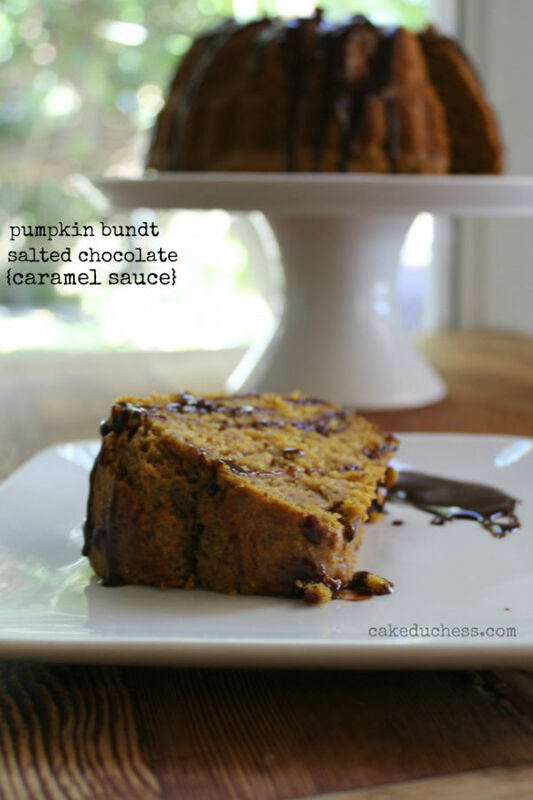 There are so many pumpkin goodies that I want to bake and this one is moving up to the top of the list. 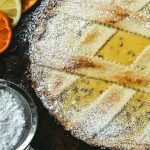 I love baking with pumpkin all year round, but I love this time of the year because this is when I see some great recipes like this one. And salted caramel chocolate sauce over the top? – be still my heart. All I can say is that my kids had better hide their stash of Halloween candy or it may just disappear and reappear as a bundt. What a wonderful and imaginative pairing of flavors, love the salted chocolate caramel sauce with pumpkin!!! This cake is a little bit of genius! I can just imagine how the pumpkin so nicely paired with your unique caramel chocolate sauce. 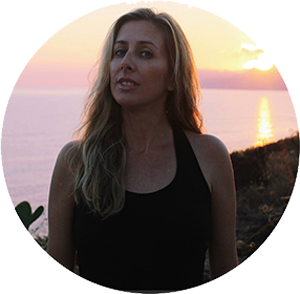 I LOOOOVE those dark chocolate sea salt bars! So I'm not sure mine would have even made it onto the cake 😉 Lovely Lora! This one might very well be my favorite bundt of yours yet! I love pumpkin and chocolate and LOVE chocolate caramels! But this bundt looks super moist and such a perfect texture. Wonderful the addition of the sauce. Perfect autumn and halloween treat!